Home › RELAXERS/TEXTURIZERS › Dark &Lovely No-lye Relaxer Regular. One application or two retouches Moisture replenishing for ultimate body & shine, Not only is your hair silky-straight, it has ultimate body & shine Safer and gentler than ever. 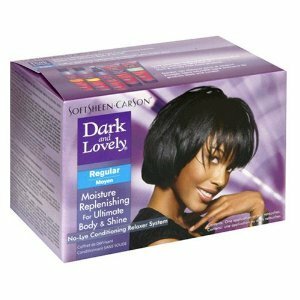 Dark and Lovely is the only No-Lye Relaxer featuring a moisture replenishing system! New moisturizing benefits added to the advanced no-lye conditioning formula using a combination of natural ingredients and body enhancing polymers. The formula infuses and seals moisturisation into each and every hair strand providing a soft and full finish. Not only is your hair silky-straight, it has ultimate body & shine! Step 3. Part hair into 4 sections.